Hands are sometimes totally forgotten when we think of rejuvenating the face and body. Make sure your hands don’t let you down. What we mean by hand rejuvenation or hand smoothing is the improvement of the quality of the skin on the back of the hands, the side that usually suffers the most solar and chemical damage. The reason for this is that the back of the hand is subject to trauma and damage whilst we carry out our tasks of daily living. There is never a time that we are not using our hands and so we have to make sure that we have treatments available to turn back the effects of time. This is the most versatile and powerful form of hand rejuvenation. 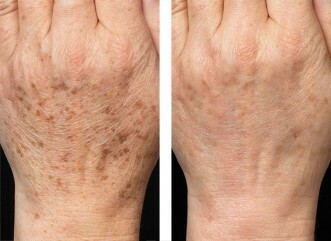 The CO2 fractionated laser treatment removes age spots and solar spots from the skin on the back of the hands. The change in the skin is remarkable. In fact, it is one of the safest and most predictable treatments available for the back of the hand. At Dermaskin, we have treated thousands of patients for solar ageing of the hands and we have consistently had the highest satisfaction and feedback from all our clients. To book and appointment please call us on our number above. The other major treatment for hand ageing involves the injection of a dermal filler into the area of the back o f the hand. 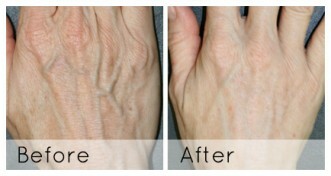 This works by smoothing the contours of the tendons and blood vessels, making the hand look more youthful. Dermal fillers for the hands are safe and we have performed this procedure on hundreds of patients every year. The popularity of this treatment has only increased since 2012 when it was featured in the popular press. The natural, undetectable results are a favourite amongst our clients as there are no signs of treatment. You just get SMOOTH and YOUTHFUL hands. The results speak for themselves and it is one of most successful and dramatic procedures for the back of the hands. To book a consultation with one of our expert doctors, please give us a call on our number above. We may sometimes recommend that you have both treatments, that is Laser CO2 Rejuvenation and then followed by Hand Smoothing. This will only be done if this would be particularly beneficial for your particular skin and only once we have assessed your hands completely. Rest assured, you will be looked after by our highly experienced doctors and you will have plenty of opportunity to talk through any issues that you may have, in a relaxed and informal setting.